Parts of the United States are experiencing an influx of snowy owls this winter season. Minnesota is experiencing a small part of the increased presence . We understand the excitement and awe that many have to see these owls up close. However, please remember that these ghostly visitors can easily be affected by our actions. All of us play a role in true conservation. View wildlife from a safe distance for both you and them. If the animal interrupts its behavior (resting, feeding, etc. ), then you are too close and must distance yourself. · Never crowd, pursue, prevent escape, make deliberate noises to distract, startle or harass wildlife. The impact is cumulative. Consider that you may be the 65th person to yell “hey bird, etc.” at that animal that day while it’s attempting to tend to its young. · Never feed or leave food (baiting) for wildlife. Habituation due to handouts can result in disease or even death of that animal and injury to you. Do not enter private property without permission of the landowner. Stay on roads, trails and paths where they exist; keep habitat disturbance to a minimum and acquaint yourself with the fragility of the ecosystem. · Respect the routine needs of animals—remember that others will attempt to photograph them, too. The welfare of the subject and habitat are irrefutably more important than the photograph. Use appropriate lenses to photograph wild animals - if the animal shows stress, move back and use a longer lens. Last weekend I ran into a group of 8 or so people inVermillion who were baiting a snowy owl in order to take photos. One man said it's standard practice, I was unsure of this but I told him I thought it was considered unethical to interfere with the birds. Sorry now I didn't speak up more. I had no idea people did this bating either. IMO it takes the thrill of Nature Photography a big step down. Mary. Consider it sent out. I sent a birding enthusiast, who was also a friend, to the 'cornfield' because of his using calls to flush Barn owls for his birding pleasure. When I called him on it, he said he would continue the practice and didn't care how it affected the bird's well being. It's people like that who give birders a bad name. 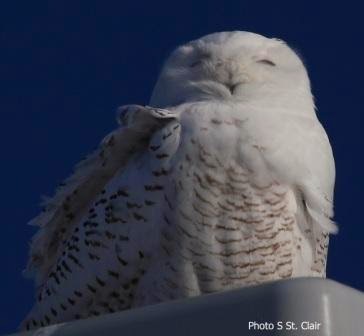 Ran into a group at 180th / Hogan Dakota site on Friday that was throwing field mice in the field for a Snowy owl. The primary person in the group appeared to be from the raptor center. I questioned her as to the ethics of this, she answered it was fine so long as the feeder mice were certified as clean (can't remember her exact word but this was the gist). I repeated the fact that this practice is frowned on and she explained that 70% of the snowys die of starvation, apparently to provide a reason for these actions. As a photographer I got some great shots, but the situation didn't feel right to me. This bird is way too acclimated to people now, expecting that it will be fed by all the visitors. Is the Raptor Center actually supporting this action? If that is true the person should not work for the Raptor Center anymore since they violated their own rules. Either that or the photog was lying about where they worked. And TRC's 40th Raptor Clinic Patient Is . . .